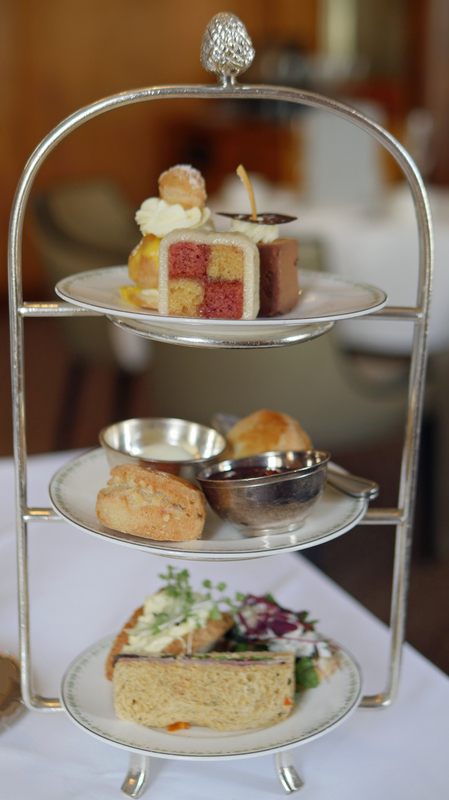 Any visit to York should include an afternoon tea at Bettys. For that matter, so should any visit to Harrogate, home of the original Bettys tearooms. Bettys are celebrating a very special anniversary; founded in 1919, they are 100 years old this year – and there’s a special calendar of events that runs throughout 2019. Last year when I was exploring the history and heritage of York, I was lucky enough to enjoy an afternoon tea at Bettys in York. The kind of tea which means you definitely shouldn’t eat lunch and probably won’t want to eat dinner. I was a bit apprehensive when I approached the pretty shop and tearoom at Bettys York in St Helen’s Square. There were queues around the block and the ground floor space looked packed. 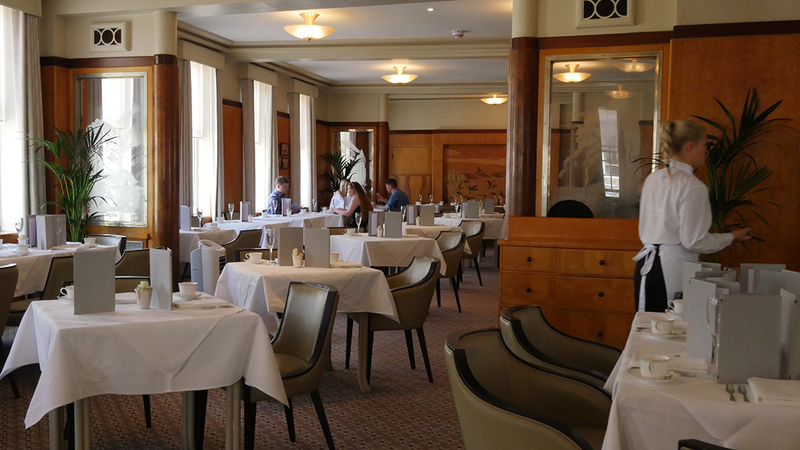 What I hadn’t realised was that the upstairs tearoom at has to be prebooked and that space is a calm oasis with well-spaced tables, white linen and a piano player gently serenading the diners. 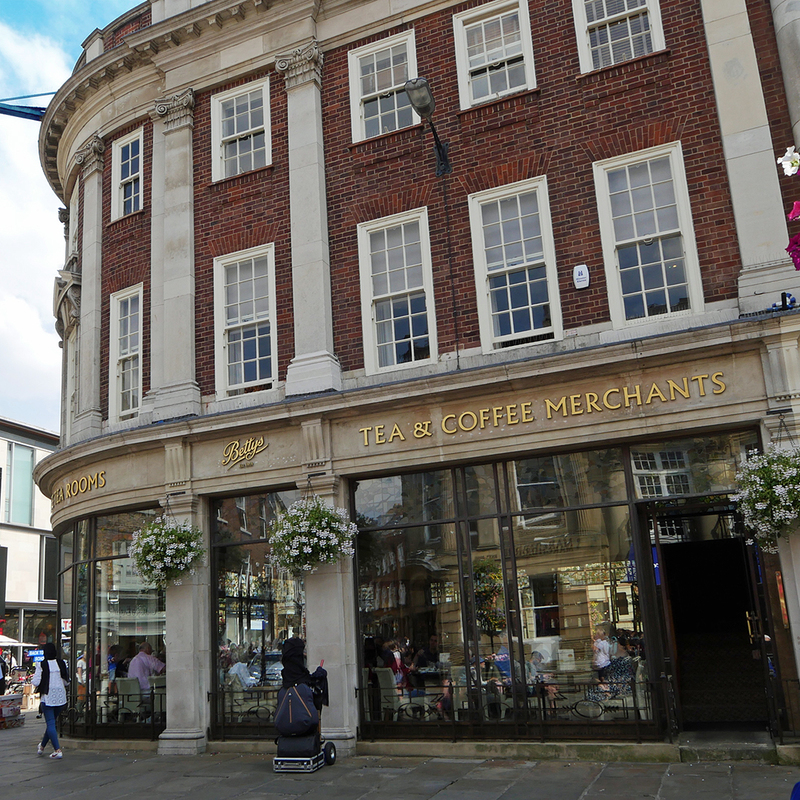 There’s a second Bettys in York in Stonegate which doesn’t take bookings at all. Personally, I’d pre-book, but of course, if you haven’t managed to do so then it’s well worth taking a chance. Afternoon tea includes a wide choice of premium teas (silver needles for me), leaf tea properly served in a teapot with your choice of milk or lemon. 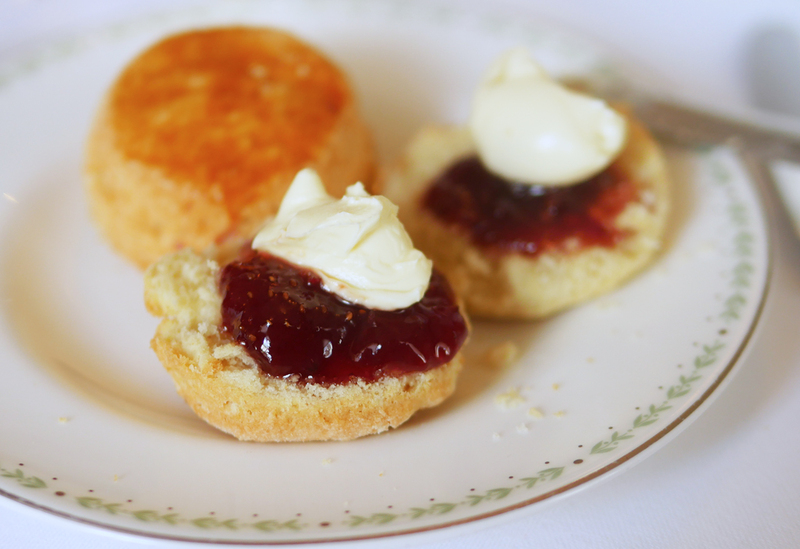 And if you indulge in the Lady Betty afternoon tea (which of course I did), you’ll be offered a glass of champagne (Hébrat premier cru or Moutard Rosé prestige) or a Kir Royale. 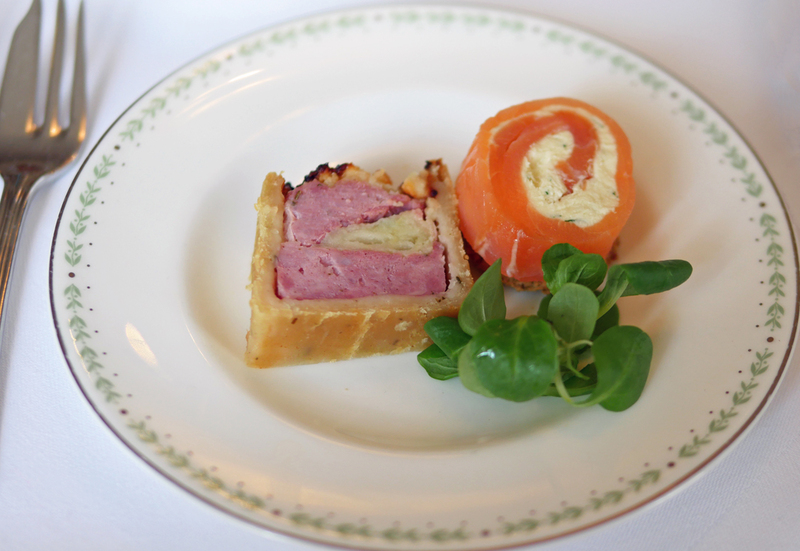 a slice of miniature pork and apple pie with Bramley apple, rosemary and thyme and a smoked salmon and cream cheese and dill roulade. 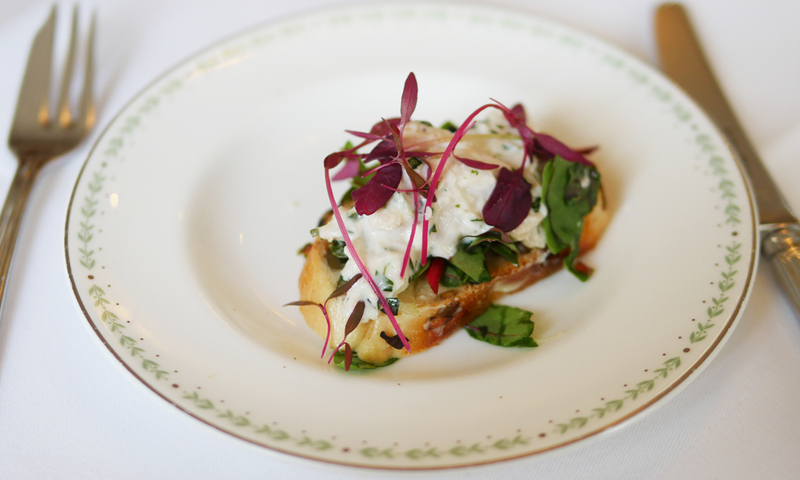 Three sandwiches included a classic ham and tomato with mixed leaves on sun-blushed tomato bread, a delicious egg mayonnaise with Yorkshire eggs and cress on wholemeal bread and a lush chicken and tarragon open sandwich with chicken in a tarragon mayonnaise. All perfectly executed, I was looking forward to the sweet selection of the pretty tea tower. Freshly baked scones came with a good portion of clotted cream and raspberry jam were spot on, clearly freshly baked and warm from the oven. As there was only one of me, I picked from a selection of cakes. 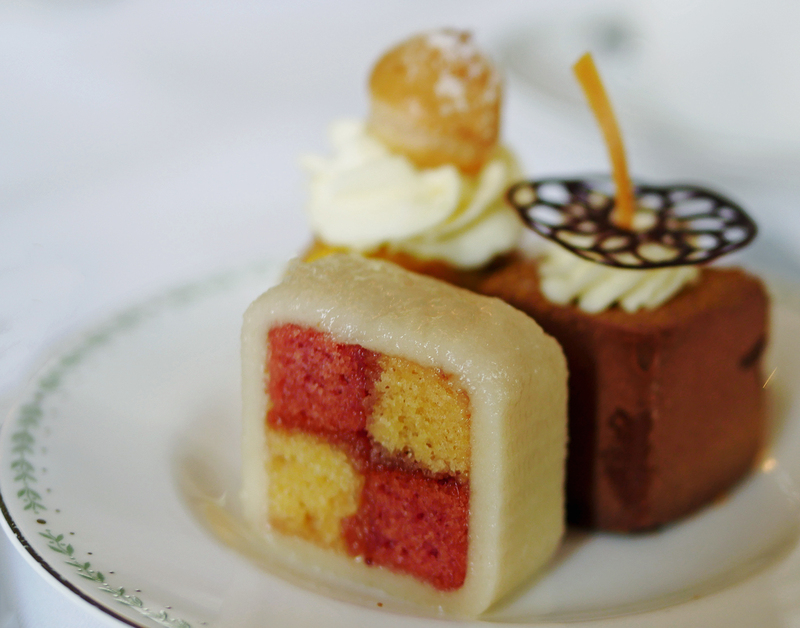 I loved the perfect miniature Battenberg – a retro cake I don’t remember being anything like as nice when my Grandma served it (probably with the help of Mr Kipling!). 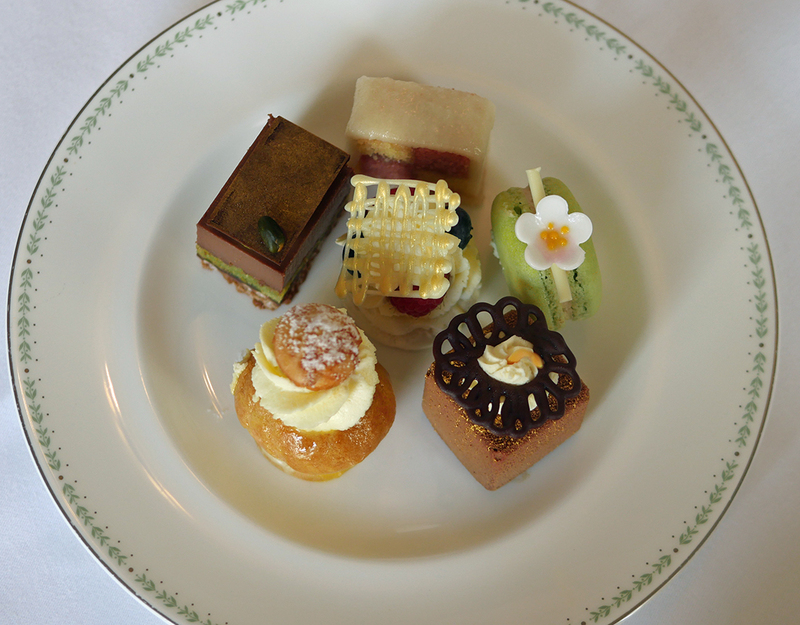 My favourite was the Lemon Religieuse – a delicate choux bun filled with lemon crème diplomat on a crisp little biscuit all glazed with a lemon fondant and topped with a little pralinée choux. The chocolate and passionfruit cube – a chocolate mousse with a passionfruit centre. I wish I could have tried the other cakes. In particular, the gooseberry macaron. Instead, I took a picture! 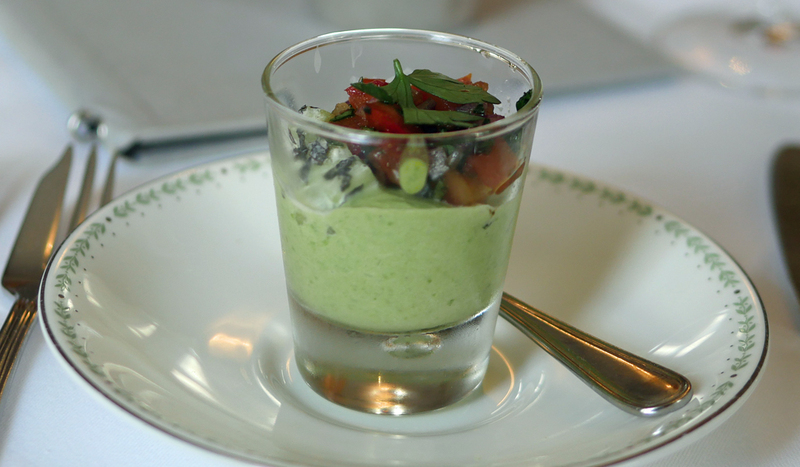 It’s a lovely afternoon tea that would challenge the best of the London Park Lane offerings – though the price is half that you’ll pay in London! So if you happen to be near one of the Bettys Tearooms (there are now branches in Northallerton, Ilkley and Harlow Carr too), I’d definitely recommend treating yourself. If you are not, then, of course, there’s an online shop with hampers, gift boxes, chocolates, tea and cakes all available by post. The founder of Bettys, Frederick Belmont, was a Swiss chocolatier who came to England. Apparently, he arrived on the South Coast and got on the wrong train which took him to Yorkshire. And, there, in Harrogate, he founded Bettys a hundred years ago. His Swiss heritage perhaps explains the quality of the chocolate used in the cakes, pastries, biscuits and chocolates. It which is what I used to think of as ‘grown-up’ – made from the finest Swiss Grand Cru couverture from Felchlin of Switzerland. 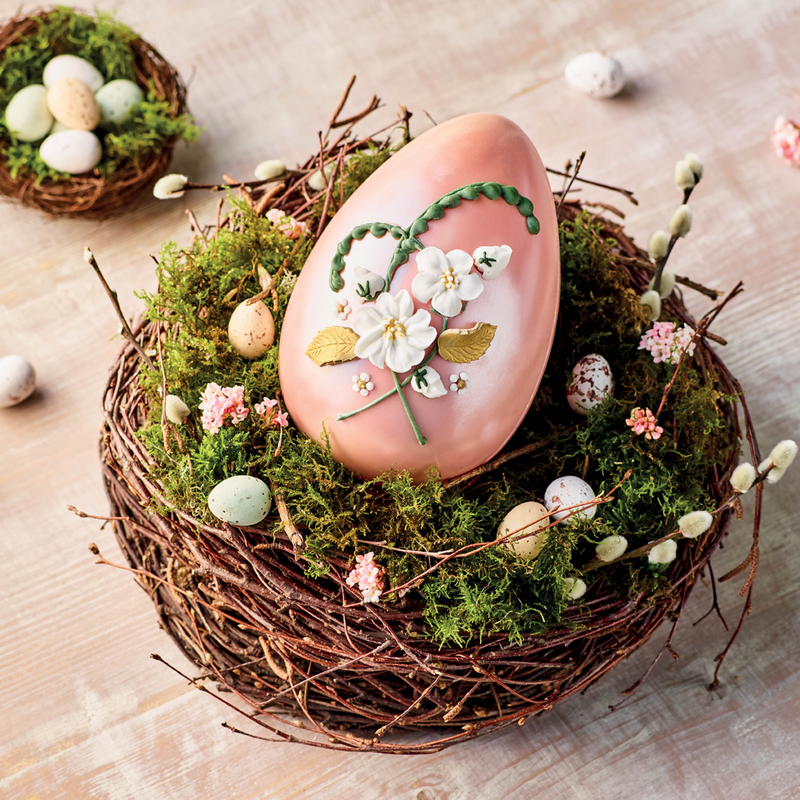 As you might expect for their 100 year anniversary, Bettys have come up with something special for Easter. This year there’s an almost too-beautiful-to-eat white chocolate Easter egg coloured the muted pink shade that Frederick Belmont chose for the first Bettys café. It’s hand-finished with silver lustre, green stems and white wild roses. I’ve got one to giveaway, just in time for Easter! 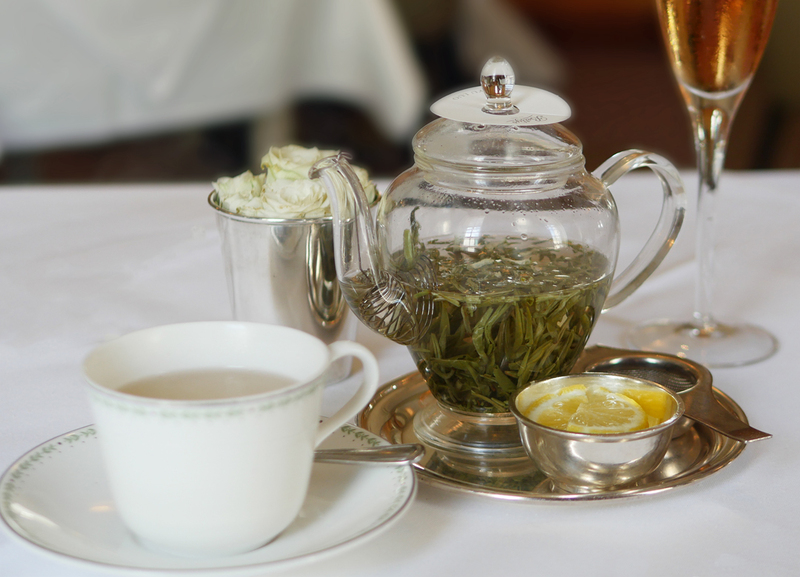 All you need to do is complete the rafflecopter, remembering to answer the mandatory question – I’d like to know which of the teas that Bettys sell you most like the sound of – and why! Check their website to make your choice!